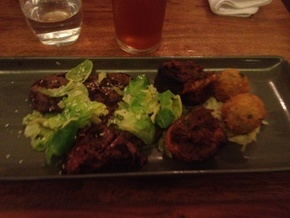 The Stables Bar was reviewed on Monday 24th June 2013 18:33 by Richard. It seems like its been a while since a new bar opened in Perth's CBD, there's been a bit of a lull since all the 'Brookfield Bars' opened their doors (think Lafayette, Print Hall and Trustee). 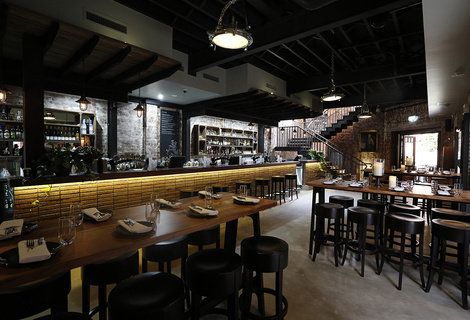 One of the newest and possibly the most impressive looking is The Stables bar on the west end of Hay Street. 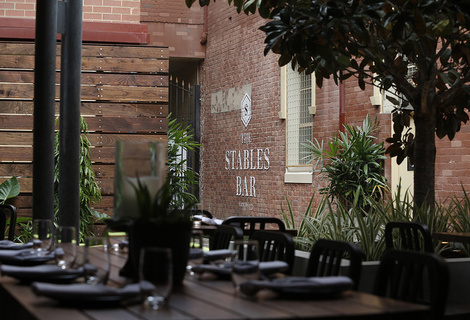 Recently opened, The Stables gets its name from the building's historic use, as one of Perth's first horse stables, set back from the hustle and bustle of Hay Street. Matt and I decided to give it a go for an after work beer and meal. I've stopped in before during the day, just to have a look, and I'd have to say it's one of the best looking bars I've seen in a while. 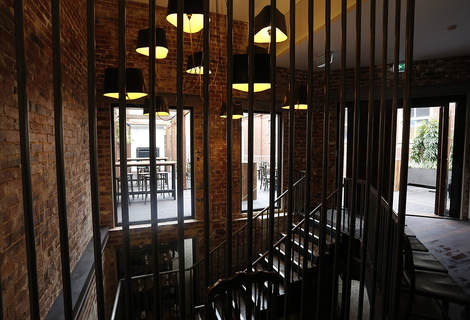 The interior designers have done a fantastic job at preserving the place's historical charm, seamlessly merging it with some of the more modern fittings and finishings. There's plenty of space both upstairs and down, seeing as the down stairs area was fairly full of people sneaking in a cheeky after work brew, we decided to head upstairs to sit down and enjoy a meal with a bit more personal space. The night was not off to a great start, our waitress obviously wasn't having the best day of her life and was a touch on the grumpy side. Nevertheless she was still quite efficient at her job and by the time we had a couple beers and our meals we couldn't really care less what mood our waitress was in. There was a fairly decent selection of drinks on offer, but I just couldn't go past an ice cold pint of Little Creatures (well it was a schooner but all the same it was amazing). In addition to the great range of beers and wines, the food menu was just as interesting. There wasn't a huge number of items on the menu but they all sounded really good - definitely not your average pub food. Matt went with the Organic Beef steak with oxtail and Yorkshire puddings and I couldn't go past the Twice cooked pork belly. Our food came out fairly quickly and was really well presented on the plate. Matt's steak was very tasty and perfectly cooked. 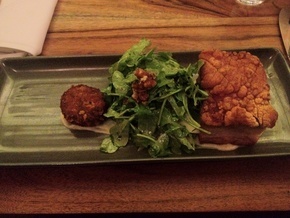 My pork belly was outstanding, not too fatty and the crackling was insanely crunchy and delicious. If I had to pick a last meal, crackling would definitely feature quite heavily. The meals looked quite small when they were served but were actually just the right size. If you're really hungry I'd suggest getting a side or two with your meals but for us they were perfect. Not only was the food great but the prices were damn good too, both mains were under thirty dollars (an absolute rarity in Perth these days) and drinks were semi-resonable too, my only gripe being that they were served in schooners not pints, but that seems to be they way things are going these days. I highly recommend trying stables out for a drink and/or a meal if you're looking for a change of scenery in the CBD. The place gets absolutely packed out on Friday evenings (but where doesn't), so it might be worth giving it a go on a week night if you're after a meal. I'd probably still make a booking because with meals and prices this good I wouldn't be surprised if they're full most nights. 9/10Lost Society Bar in Perth, WA (79m away)Swanky new bar in the CBD – great range of drinks and amazing food.